The 403 forbidden error in WordPress is a commonly occurring HTTP status code that can occur anytime and hamper you from accessing your WordPress site. it simply means that it is ‘forbidden’ to access the page/resource for some underlying reason. This guide explains what this error means and why it is caused and quick ways to fix it. What is the HTTP 403 Forbidden Error? The user’s IP address has been blacklisted by the server. Domain has been resolved to the hosting, but the server hasn’t bound with the domain. The firewall may be denying the user requests. When you try to create and write file under directory list that doesn’t let you read/write. The web page’s script file doesn’t allow permissions for executing within the current directory. There is a busy server as the same IP keeps sending multiple requests. In fact, there can be even more reasons for causing the 403 forbidden error in WordPress. So how can you identify the cause and fix this WordPress error? The following steps should help you. However, there is an even more elaborate guide at the 000Webhost blog that covers all the underlying causes and has a more detailed approach. If you can fix the error using these simple steps, it should be fine, but if you are unable to find the cause through this guide, it is recommended to check the blog post. Deactivate all the plugins installed on your site. If the error persists even after deactivating all the plugins, you should simply move onto the next step to troubleshoot the error. If not, then reactivate one plugin at a time. FTP Access: You can use cPanel (provided) by your hosting provider to access and modify .htaccess from within File Manager. At the same time, you can also use other FTP clients for accessing the file. WP Plugins: You may also use WordPress plugins for stabilizing .htaccess file. One example includes the WP htaccess Control. Such plugins can be found just like you usually search for plugins within the dashboard. If you think that the 403 forbidden error has been caused by a corrupt or modified .htaccess file, you will have to delete it. Access the root folder of your WordPress site using an FTP client and delete this file. This is a simple way to create a new .htaccess file and it will not affect the other functions of your WordPress site. If a corrupt .htaccess file was causing the problem, this should fix it. As already mentioned, there are many causes that could be causing the 403 forbidden error in WP. If you are unable to fix the problem using the above-mentioned steps, it is recommended to check the 000Webhost blog post for an in-depth coverage of the topic. Contact your hosting service’s support team. The error may also be caused due to improper server or security configurations. IN such a case, no matter what you do, the problem continues to persist. So it is better to inform your web host even when you are attempting other troubleshooting methods. Another thing you should consider doing is to check and fix the index.php file. The method is as simple as deleting this file from within the root directory of WP and then uploading a new file. You can also consider modifying the Index Manager. It is important to ensure that the Index Manager settings have not been changed to No Indexing. The 403 forbidden error in WordPress may also be caused due to changes in the IP deny rules. Such changes can block your IP within the web server. Make sure to unblock it from within control panel. Considering installing a new copy of WordPress itself. In fact, this is something of a last resort. 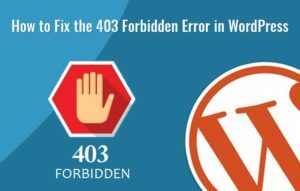 If you are unable to fix the 403 forbidden error in WordPress using any methods, you should consider this option. The 000webhost blog has a post that guides you on how to install WordPress. So you should use the above-mentioned steps to address the 403 forbidden error in WordPress. It can be caused due to many reasons and it can take some time to identify the root cause. The steps explained here are simple and anyone with basis WP site management skills can follow them. It is highly recommended to take a backup of your website and database before you begin troubleshooting.